The famous "Captain America" chopper Peter Fonda rode in the classic film Easy Rider is once again hitting the auction block. Michael Eisenberg, a Los Angeles developer and memorabilia collector who's had the bike for a year, hopes to raise $1 million when he puts it up for sale on Oct. 18. 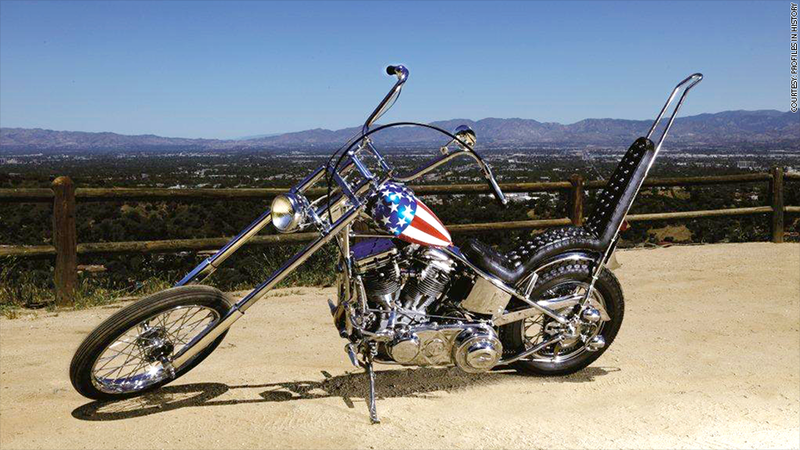 The bike is the only survivor of four motorcycles: Two custom Harleys used by Dennis Hopper's character and two Captain Americas used by Fonda in the 1969 classic. A biker gang stole all of them except one Captain America bike, which only survived because it was destroyed in the film's final scene, burning next to a levee as the camera panned away. Fonda gifted the scraps to Dan Haggerty, who kept the motorcycles running during Easy Rider's filming. Haggerty restored the motorcycle and kept it. He sold it in 2002 to John Parham, president of the National Motorcycle Museum in Anamosa, Iowa, where it was a big draw for more than a decade before Eisenberg bought it from him in January for an undisclosed sum. While Eisenberg had the bike, he kept it in a warehouse behind a set of stanchions -- at one point in a giant bubble. Occasionally he rode the bike, with its long unwieldy front fork and missing front brakes, onto public streets. "If you want to make a turn you have to make reservation in advance," he said. Then he decided he wasn't the best steward for it, and now he's selling it. Eisenberg will also be donating a percentage of the proceeds to the American Humane Association, which is the group behind those "no animals were harmed" disclosures at the end of movies. Robin Ganzert, the AHA's president and CEO, said Haggerty called about a month ago to drop the news, though he didn't tell her how much would be coming their way. She said the group was a favorite charity of Peter Fonda and that his father Henry was a big part of it. Joe Maddalena, CEO of the auction house running the sale, Profiles in History, said he and Eisenberg valued the bike based on a couple of other high-profile bike auctions: a landspeed record-holding Vincent that sold in 2011 for $1 million and a custom Harley that sold for $800,000 in 2006. Profiles in history will get a 20% premium on top of the final selling price. Since they figure Captain America is just a bit more famous than that pair, they think they can get more. "It represents a generation," Eisenberg said. "It represents freedom."